If you ask a student how they elaborate and add more details to their writing, most students will be limited in what that actually means. They know what you want, but struggle with the strategies to make this happen. 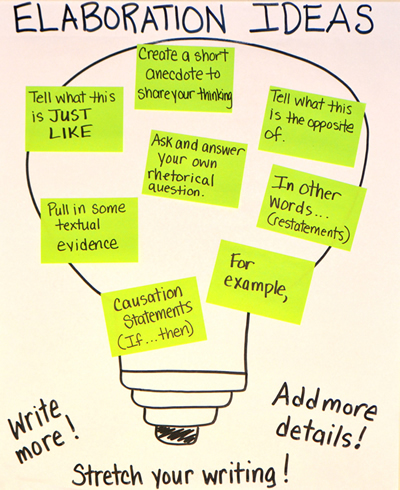 This chart was created with seventh grade students working on informational and argument writing, but is appropriate for all grade levels. To create this chart, I drew a light bulb and gathered a set of blank sticky notes. I read a three sentence paragraph that was very limited in details. I asked students how they could stretch this paragraph by elaborating more. I called on students to share ideas. As they shared suggestions, I either guided them to name a universal strategy that I could add to the light bulb. After they exhausted their ideas, I continued prompting until I added each of the seven strategies. After each strategy is added to the chart, write 1-2 examples on a sentence strip or on a dry erase board. Create this on your wall, instead of the chart. Use each of the strategies as a heading. After teaching each on, ask students to craft and share an example. Add some of these student generated examples under the name of the strategy. Using your science or social studies books, pull sentences that follow these elaboration techniques. If you don’t have access to these consider online articles. You would be surprised how often these techniques show up in the news and in professional writing. Try nytimes.com/roomfordebate to get started.